A 16-year-old boy accused of making a bomb to "kill many people" told police it would make him "stand out" and look cool, jurors heard. The Bradford teenager, who cannot be named for legal reasons, is accused of making the CO2 bomb in June 2018. 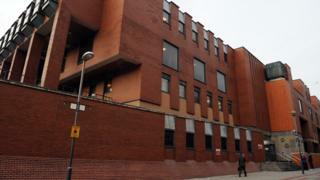 He denies five terrorism-related offences at Leeds Crown Court. In a police interview after his arrest last August, the boy described being in the cells as "wicked" and said the situation was "cool and funny". Prosecutor Paul Greaney QC said the teenager was bullied at school and he talked about bombs because: "Bombs sound cool and will make me sound cooler. It makes me stand out and I look more cool". The court heard the boy denied planning an attack on anyone or any place, and told police: "If I was a terrorist, do you think I would leave the device [bomb] on the bedroom floor? "If I was a terrorist, I would hide it to the best of my abilities." Jurors previously heard the teenager told pupils he was going to carry out a school shooting and had praised Adolf Hitler. Officers found two carbon dioxide canisters joined together and an assortment of nails, tacks and panel pins at his home, as well as a document containing bomb-making instructions.